The Wildfire Management Tool Web edition (WMTweb) is a web application and REST server that work together to display the potential behavior of a wildfire in your web browser on your mobile device or desktop computer. WMTweb is the first place award winner among the professional teams in the NASA World Wind Europa Challenge 2015 held at the FOSS4GE conference in Como, Italy. Improve the safety of firefighters and ensure the effective use of firefighting resources. Promote the principles and tenets of Campbell Prediction System (CPS) for predicting wildfire behavior. Provide an extensible and reusable application platform for NASA Web World Wind applications. WMTweb is free! It has been granted a permissive license (BSD-3) to encourage and promote its reuse in other applications and projects. Developers are encouraged to clone or fork this repository. Instructions for building the WMTweb are found in the repository's Overview page. Parties interested in building the application should find the Software Architecture and Software Design pages informative and useful. Watch a three minute demonstration video that shows how WMTweb works on a mobile device: the NASA World Wind 2015 Europa Challenge video is available in the Emxsys channel on YouTube.com. Click here to run WMTweb: wmt.emxsys.com. The link opens WMTweb in your web browser. Please use Chrome or Firefox. Internet Explorer is not supported; there is partial support for Safari. Your browser must be compatible with WebGL to run WMTweb: the underlying NASA Web World Wind technology uses WebGL to render the globe. You can check your web browser's compatibility at get.webgl.org. If Chrome doesn't work on your device, try FireFox, and visa versa. Updating your browser to the latest version may be required. WMTweb is being designed with direct input from several agency representatives, fire chiefs, training officers, fire behavior analysts and domain experts. The outreach is expected to go beyond the firefighting community and out into the general public. Fire prevention personnel intend for the web application to advise and educate homeowners who live in the WUI and are exposed to the risk of wildfires. Wildfire is an international concern. WMTweb has been designed to accommodate multiple languages and units of measure, as well as county and agency specific fuel models and weather resources. WMTweb v1.0 is functional for the US and the "en" locale; future versions will support user selectable languages and locales (subject to the availability of translators). The issue at hand is how to convey spatiotemporal fire behavior information effectively and efficiently. Fire behavior is the manner in which a fire reacts to the influences of fuel, weather, and topography. Figure 1 depicts some of the named components of a wildfire. A wildfire is a large, destructive fire in the wildland that spreads quickly over woodland or brush. Note that not all wildland fires are "wildfires". There are "prescribed fires" which are planned, controlled burns used to remove hazardous fuels or improve the habitat. And there are "backfires" set by firefighters to consume the fuel in the path of a wildfire. 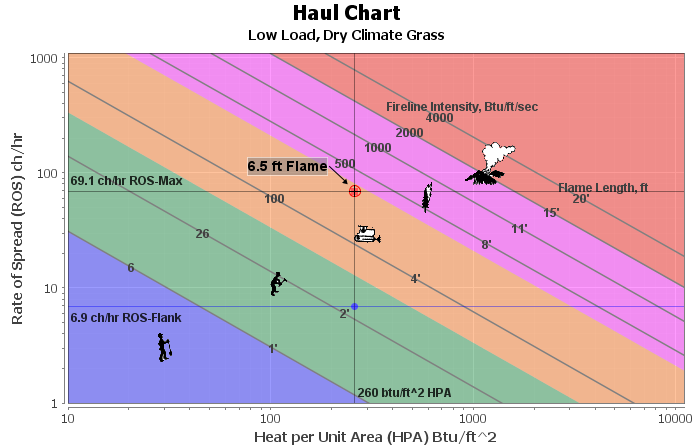 The Haul Chart, seen in figure 2, is the existing tool used today for depicting fire behavior information. The problem with this display is that it is point based for a single point in time, and for a single geographical location. 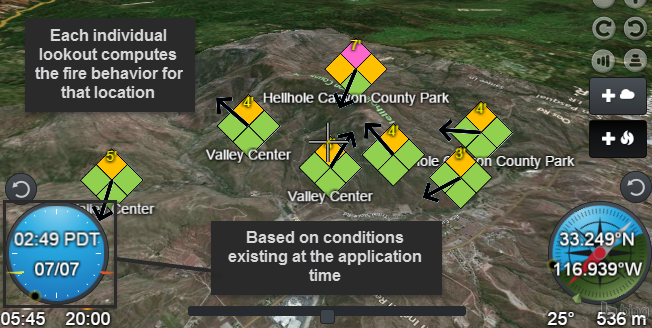 It's difficult to view the fire behavior in the context of several locations at one time. It's also lacking flanking fire behavior. Many users consider the Haul Chart too complex for their needs; adding more information to the graphic would be detrimental. The WMTweb software project has two significant goals, the Wildfire Diamond and the Wildfire Profile. Both which are original ideas born of this project; each which strive to improve the effectiveness of communicating spatiotemporal fire behavior information to those in need. Fig. 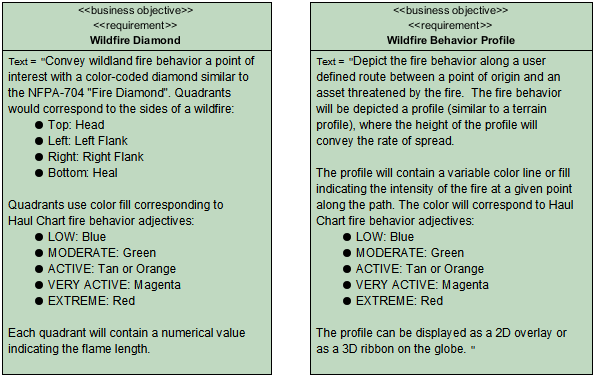 3 depicts the Wildfire Diamond and Wildfire Profile requirements. WMTweb v1.0, developed for the NASA World Wind Europa Challenge 2015, satisfies the Wildfire Diamond goal. The Wildfire Profile will be manifest in a future release. WMTweb introduces a proof-of-concept Wildfire Diamond symbol to the wildland firefighting community. The Wildfire Diamond conveys wildland fire behavior information at a point of interest via a color-coded diamond similar to the NFPA-704 "Fire Diamond". The objective is to make an informative, but simplistic symbol for depicting fire behavior information. This symbol represents the potential fire behavior at the point at which it is positioned on the globe. The symbol in Fig. 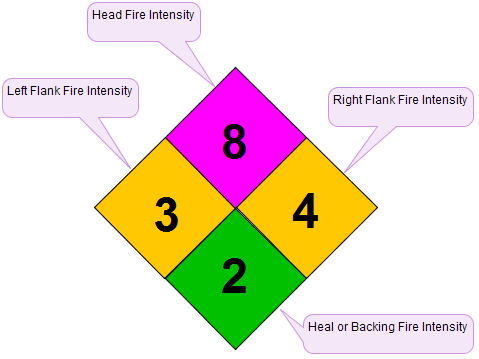 4 is comprised of four quadrants, each one representing one of the four main parts of a wildfire: the head, left and right flanks, and the heal. Each quadrant is color coded to indicate the severity of that part of the fire. The colors are described in Table 1. LOW 0-1’ Blue Fire will burn and will spread however it presents very little resistance to control and direct attack with firefighters is possible. MODERATE 1’-3’ Green Fire spreads rapidly presenting moderate resistance to control but can be countered with direct attack by firefighters. ACTIVE 3’-7’ Tan Fire spreads very rapidly presenting substantial resistance to control. Direct attack with firefighters must be supplemented with equipment and/or air support. VERY ACTIVE 7’-15’ Magenta Fire spreads very rapidly presenting extreme resistance to control. Indirect attack may be effective. Safety of firefighters in the area becomes a concern. EXTREME >15’ Red Fire spreads very rapidly presenting extreme resistance to control. Any form of attack will probably not be effective. Safety of firefighters in the area is of critical concern. In WMTweb, this symbol reacts dynamically to the ever changing weather and solar conditions by changing the colors in its quadrants to reflect the given conditions. Multiple symbols can be arrayed on the globe such that the user can visualize the stability, or instability of the entire fireground. The simplicity of the symbol belies its significance and complexity. Exposing the flanking and backing (heal) fire behavior predictions is a new concept. 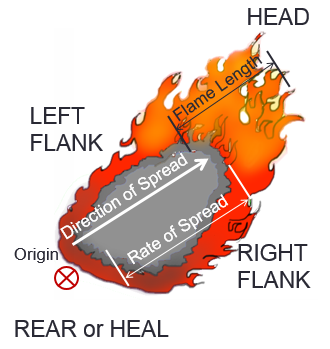 So much emphasis has traditionally been placed on the head of the fire, but it is at the flanks and heal where the firefighters are generally working. Thus being able to anticipate the changes in these areas is important for the safety of firefighters. Fire Lookouts are spatiotemporal markers you drop on to the globe. A Fire Lookout downloads a point weather forecast for its location and computes the fire behavior from the weather, terrain, solar radiation and a fuel model. 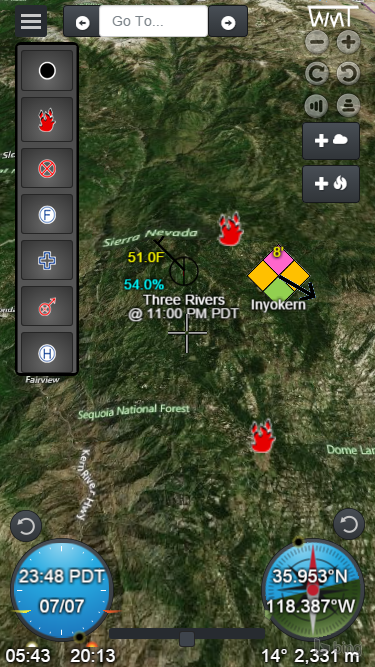 The Fire Lookout displays fire behavior data using the new Wildfire Diamond symbology, seen in figure 5. Fire Lookouts are dynamic. Advancing the application time with the time slider allows you to view the expected fire behavior in the future. 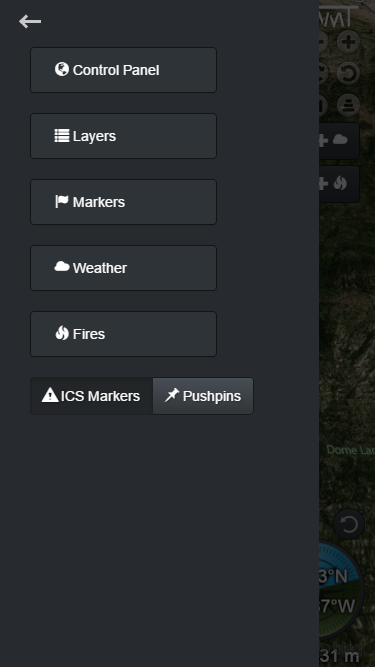 When you move a Fire Lookout it triggers a new computation the fire behavior and it updates the symbology accordingly. Fire Lookouts are designed to alert the user when a significant change is detected in the future fire behavior. This lookout mechanism takes place behind the scenes alerts the user via visual cues. Weather Scouts are similar to Fire Lookouts in that they download the weather forecast for their locations. The Weather Scouts display the weather forecasts using standard weather station symbology. They react to changes in location and time and update their symbology accordingly. The scouts are designed to alert the user when a significant change is detected in the forecast. The mobile layout is designed for fluid manipulation and examination of the WMT application, allowing any person with a smartphone and internet access to view a fire's potential behavior. A frequently requested feature, having mobile access to WMT allows firefighters in the field or en route to look at current fire conditions and predicted fire conditions. Allowing them to coordinate their efforts more effectively and more safely. Computing fire behavior is a complicated process, which involves among other factors, selecting fuel models, adjusting and conditioning the fuel to the environment and computing the "fine" fuel moisture content based on solar heating combined with the cooling effect of wind, followed by the computation of fire's intensity and flame length which includes the exacerbating effects of wind and the terrain slope. See the Software Architecture Document and the Software Requirements Specification for insights into the design of this software. The simple user interface belies the complexity of the application. The Software Development Plan details the timeline and the work that transpired to bring the software to this point. Table 2. OpenHub Metrics for WMTweb on July 6, 2015. More project metrics can be seen on the Wildfire-Management-Tool-Web project on Open Hub. Fire Lookouts are dynamic, reacting to both time and place. When you change the application time or move a lookout to a new location, the lookout must recompute the fire behavior. To do so, it makes several requests to the WMT REST services -- the WMT REST Server does the heavy lifting of computing fire behavior. When several concurrent requests occur to due to rapid changes in time or location, the client buffers and coalesces the requests to reduce the traffic and the workload. This makes for a performant and responsive system. The user interface is designed to automatically adjust its layout the device's screen size. The design follows a "mobile-first" philosophy. The Time Widget is not just a clock. It displays temporal data relative to the position of the crosshairs on the globe. The Location Widget is more than a simple compass. It displays spatial data centric to the position of the crosshairs. * Figure 9. Location Widget displaying coordinates, aspect, slope and solar azimuth. The green diamond icon that orbits the compass indicates the aspect of the terrain under the crosshairs. Its position is relative to the compass points. To see it in action, zoom in on the globe to see a ridgeline and then move the crosshairs back and forth across the ridge. A reset button resides above the Time Widget which resets the time to "now". A reset button resides above the Location Widget which resets the view tilt to look down and view rotation to north up. Markers, Scouts and Lookouts are added to the globe by selecting the desired item and then clicking the globe where you want it placed. Opening up the corresponding list for Markers, Scouts, or Lookouts provides you with the ability to "go to", edit or remove the selected item.